This is one we've done quite a lot of over the years, especially when Mr 4 was heavily into cars. 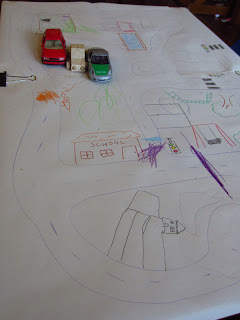 Just cover the coffee table with a large sheet of paper, draw a road on there and let the play begin. As the play progresses the kids usually ask for some other things, like a school or park or more traffic lights, but they also really enjoy adding their own drawings to it. We've even sometimes drawn train tracks for the wooden trains, with stations etc. Depending on the age of your child it can also be good to have different coloured car parks for different coloured cars.